How & where to start driving? 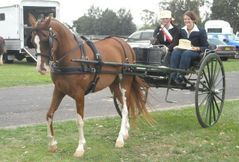 Australian Carriage Driving Society Inc.
Carriage driving is a challenging and fun sport. Whether you just want to spend some quality time driving in the countryside, get involved in show driving, tackle long distance endurance drives or the thrill of combined driving, there is something for every person. It is also a sport that suits all breeds of equines, from tiny miniature horses through to giant Clydesdales, horses, ponies, donkeys or mules, all are welcome. So if Carriage driving appeals to you, how do you get started ? One thing you should never do is buy a cart and hitch it up to your favorite riding horse expecting the horse to know what to do. If it doesn't, the results will certainly be exciting and most likely downright dangerous. * Get in contact with the ACDS club in your area. Carriage driving is a very friendly sport, and you will find that your local club will have members who are more than willing to help you. * Attend some driving events. If you want to know what is involved, attend one of the being held in your area. Attend as a spectator, or volunteer as a helper / steward at the events to get an idea of what is involved. Volunteers are always welcomed with open arms, and if you attend as a spectator don't be afraid to ask questions. * Have driving lessons. You may need to travel a long distance to have a lesson, but make a weekend of it and have a little holiday while you are at it. 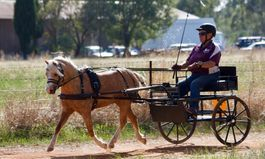 The first time you drive a carriage can be very daunting, so it is best done with an experienced person and a well behaved horse that is used to learner driver. * It is important to get the right equipment. Your harness and vehicle need to be safe, and correctly fitted to your animal. Many people initially purchase unsafe equipment as they don’t know what is required. Again, speak to your local club.